My worms arrived 2 weeks earlier than they were suppose to. My "farm" is not set up yet. How can I store them safely for a couple days while I set it up? WOW! That's a bit of a conundrum ;) No worries! I got you covered. I don't know where you bought your worms, what species they are, or how many, but no matter. I'm almost certain that they are a composting worm and not more than a pound or two. I'm also counting on you not having an Alabama Jumper (from the Endogeic Group)or a Canadian Nightcrawler (from the Anecic Group). Hopefully you DO have composting worms from the epigeic group. Theses are red wigglers, European Nightcrawlers, African Nightcrawlers, and Blue worms (Malaysian or Indian blues). I also don't know if you plan to build a worm bin or have a commercial worm system being sent to you. No problem, so here we go! So this is what I would do if you have a composting worm. 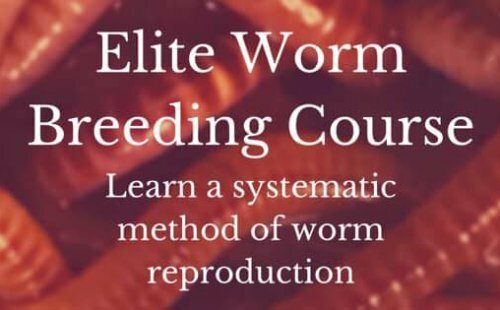 I'll walk you through this so that you can just transfer your worms and their food to the new system no matter what type it is. 1. So assuming you have 1-2 pounds of worms, find a container the size of a big (18 gallon roughly) plastic tote. 2. Fill the bottom approximately (2 inches) with some carbon bedding. The leaves should be dead fall leaves that are moist. This provides already broken down foods with very beneficial microbes. 3. If you can't find leaves (although very preferred) then use shredded newsprint, paper and cardboard. You can also mix the leaves in with this. Coco coir and peat moss will work as well but you should be fine with only the dead brown leaves and some shredded paper/cardboard. 4. If you'd like you can add some form of kitchen scrap but only a small handful, like the size of a banana peel or avocado skin. Introducing too much nitrogen will only cause problems. We aren't at that stage yet. 5. Make sure the bedding is ONLY moist and NOT wet. The worms will be fine. 6. Place the worms on top of the bedding and watch them go down into it. 7. Hang a light over the bedding so that the worms will stay in the bedding and burrow down. on top of the bedding to lock in moisture. As long as the environment outside of the bedding is dry the worms will not want to move out of it. Spritz the newspaper blanket with chlorine-free water if the newspaper dries out completely. But the issue is that it will be another two weeks before they go to their new home. If you can't make them something tonight or tomorrow then open the box they came in and let them get some oxygen. It's always a stressful trip. Open the bag to determine if they are dehydrated. If they are (contents are too dry) then lightly spritz them but be very careful that you don't get them too wet or the water will block the oxygen and air won't flow consistently. Close the bag and keep in a cool place. TY. Only got 100 red wigglers. Will have it done by tonight hopefully, tomorrow the latest. Have the bins just need to add holes etc. Got lucky. They packed them well and in a very nice breathable cloth, tiny mesh bag.